City Hostel Corvin is a mixture of a hostel and a budget hotel in the centre of Budapest. It operates from 27th June to 26th August. 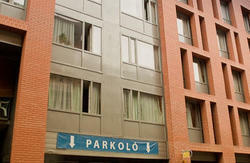 This new and good quality hostel is located in the Pest of the city and offers cheap rooms and apartments. It is ideal for smaller groups, individuals, families, friends, etc. It is easily accessible from the airport, train or bus stations. The Grand Boulevard and the tram (no. 4-6) stop can be found in a couple of minute walking distance. Children under 3 years can stay free if no bed (except baby bed) is needed, otherwise or above 3 years all children should be considered as adult and pay full price. By public transport from the airport: Take bus no.200E to K?bnya Kispest endstation, change for the metro to Corvin-negyed station and take the tram no. 4 or 6 (in direction of Szll Klmn tr or Margit hd) to Harminckettesek tere stop. Then take a short walk to the hostel. From Nyugati railway station: Take tram no. 4 or 6 (in direction of jbuda kzpont or Mricz Zsigmond krtr) to Harminckettesek tere stop. Then take a short walk to the hostel. From Keleti railway station: Take the metro (M2, in direction of Dli plyaudvar) to Blaha Lujza tr and change for the tram no. 4 or 6 (in direction of jbuda kzpont or Mricz Zsigmond krtr) to Harminckettesek tere stop. Then take a short walk to the hostel. From Dli railway station: Take the metro (M2) to Blaha Lujza tr and change for tram no. 4 or 6 (in direction of jbuda kzpont or Mricz Zsigmond krtr) to Harminckettesek tere stop. Then take a short walk to the hostel. From Npliget bus station: Take the metro to Corvin-negyed (in direction of jpest kzpont) and change for tram no. 4 or 6 (in direction of Szll Klmn tr or Margit hd) to Harminckettesek tere stop. Then take a short walk to the hostel.